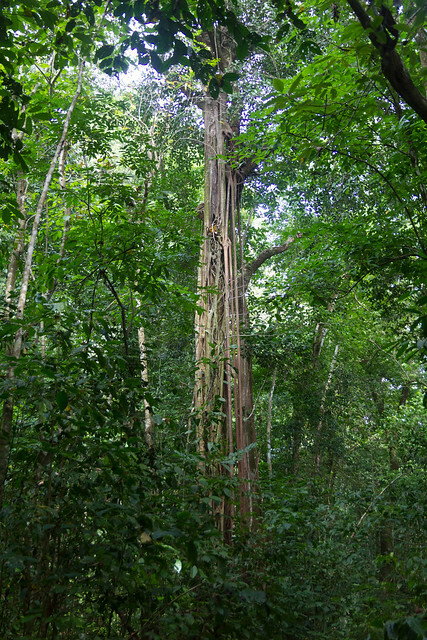 One of the highlights of Costa Rica is Corcovado National Park on the Osa Peninsula at the border to Panama. Ignoring all the statistics, this is a nice chunk of protected land with a couple of hiking trails that you are only allowed on with a guide and between 5 AM and 6 PM. For a mere $200-ish you can spend three days in a beautiful environment and two nights on a foam mat with a mosquito net under a roof. It’s bring-your-own-food, but that’s pretty much all you have to carry in. Night temperatures are well above 20C (70F), so shorts and a t-shirt are pretty much all you need in terms of clothing and the whole kitchen and stuff are waiting in place. The most challenging part of the whole trip is getting the entrance permit from the park administration. There are only 50 overnight guests allowed at any time and I was very lucky to get one of the last three spots. Otherwise I would have been limited to day-trips or waiting a couple days – not really an option given the very modest beauty and pretty remote location of Puerto Jimenez, my base for this trip. On Saturday morning, Randall, Miguel, Michael and I first spend a good hour in Miguel’s rental car getting to Carate, the end of the road and then walked about 20km to the La Sirena Station in the southwestern corner of the peninsula. On our way, we saw a lot of scarlet macaws (you can’t not hear them), pelicans flying in formation (they are considered as the Costa Rican air force, as the country has abolished its military in 1948), a bunch of other birds, capuchin monkeys, two (harmless) snakes, a sleepy tapir, two ant-eaters, a lot of nice beach and beautiful rain forest. 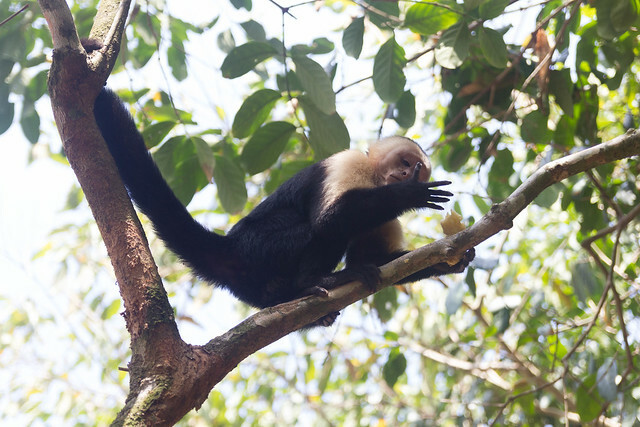 Capuchin monkey eating a banana/platano. These roots (?) 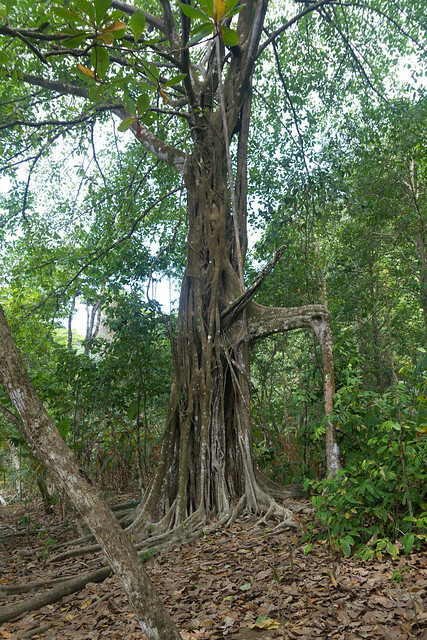 grow around a tree, strangulate it and stay in place even when the tree is dead. With daytime temperatures somewhere around or above 30C, we went through quite a bit of water that we got from a couple creeks on the way. On our arrival at the la Sirena station we passed through the airstrip and got to see loads of toucans that were enjoying the sunset on the neighboring trees. 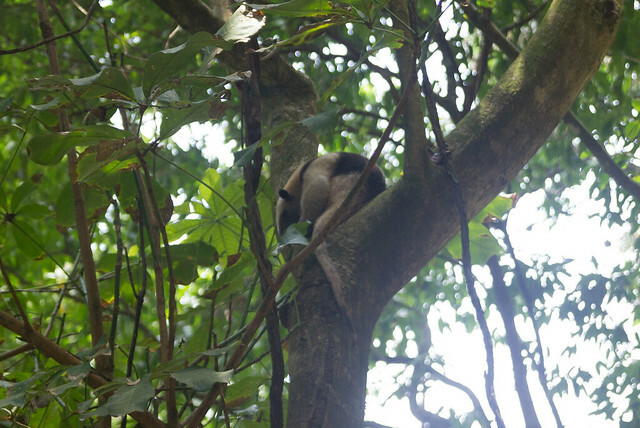 In some of the other trees, some monkeys were having a party. Dinner was the classic pasta with a bit of extras when Randall scavenged restaurant leftover food for us. At 8 PM the lights went off and we caught a bit of sleep before getting up again at 4:30 AM. 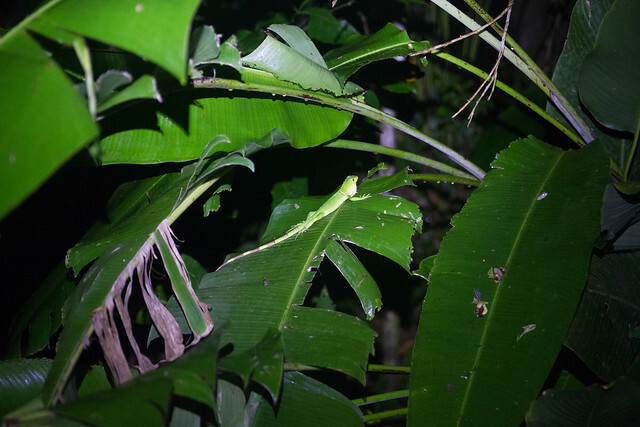 After completely blinding some owl-like little bird with our headlights, we searched green leaves for a green frog with orange eyes. 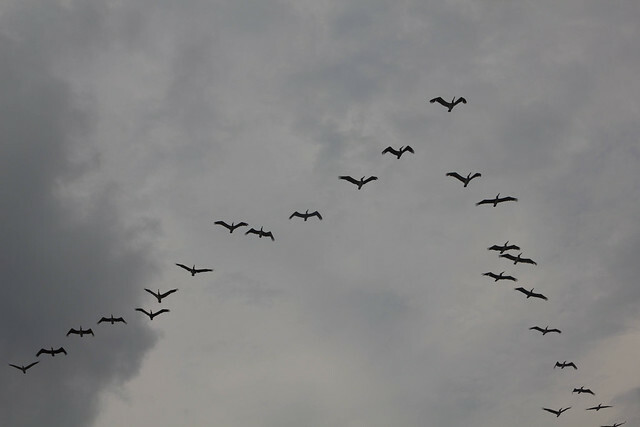 I’m sure I saw about twenty of them without noticing. 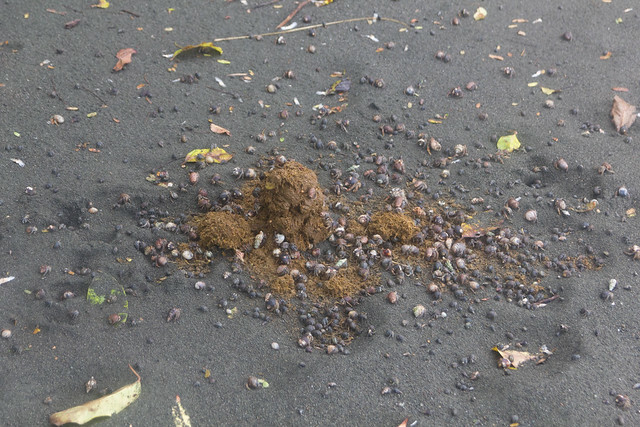 After giving up on the frog, we found a couple other little critters and – when we arrived on the beach tapir tracks leading across the next little river. 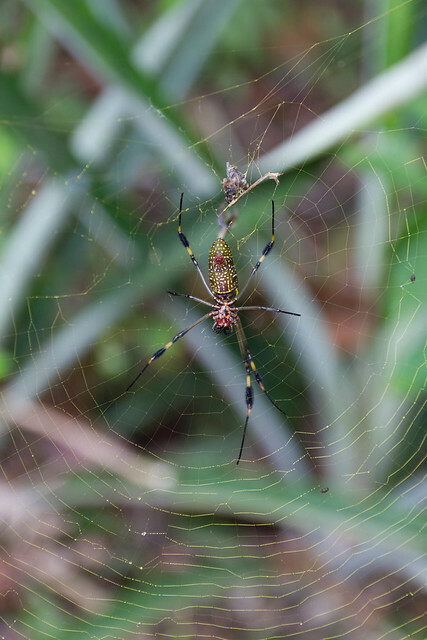 Golden orb spider – they deserve their name. 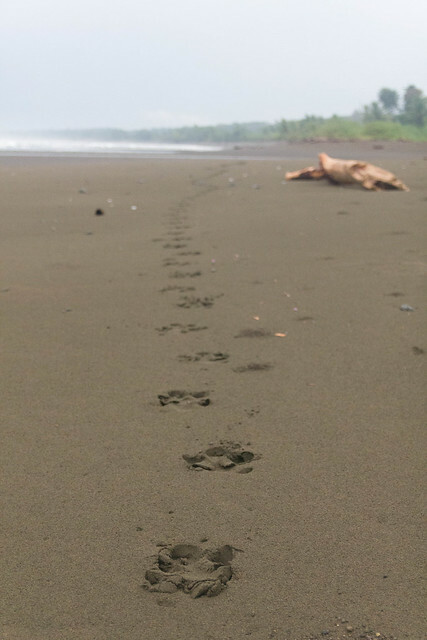 Tapir tracks leading to a little river with crocodiles. We didn’t follow them (it’s forbidden to cross the river because of crocodiles and – at high tide – bull sharks), but decided to go walking in the woods a bit and come back later for the return of the tapir that was scheduled around 6:30 AM. 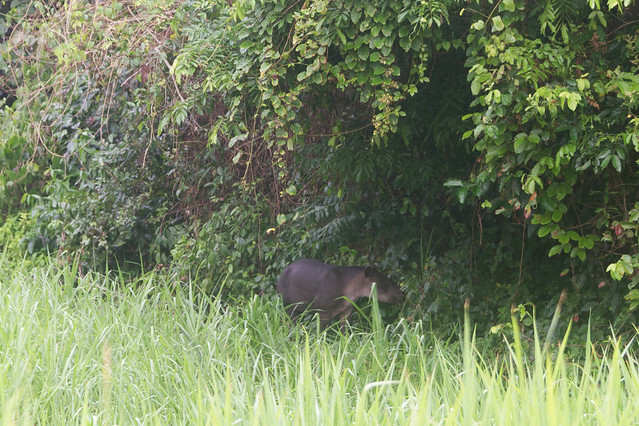 Well, when we were walking past the airstrip, other groups notified us of a tapir that was having it’s good-day-snack (they are nocturnal) on the side of the grass. After a while of munching on the trees, it crossed the high grass just next to us posing for photos. 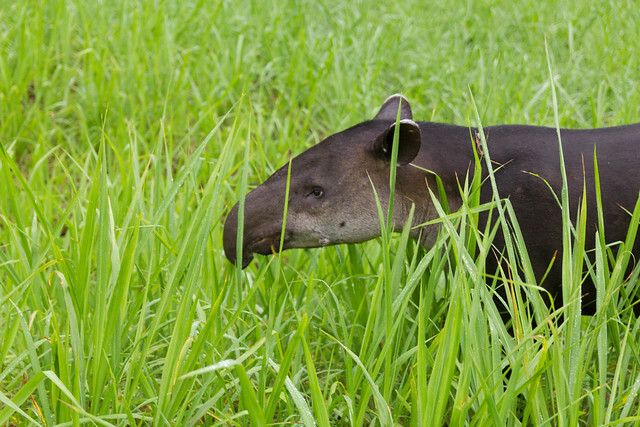 Tapir munching away on the side of the grass. Nothing stays unused in nature. 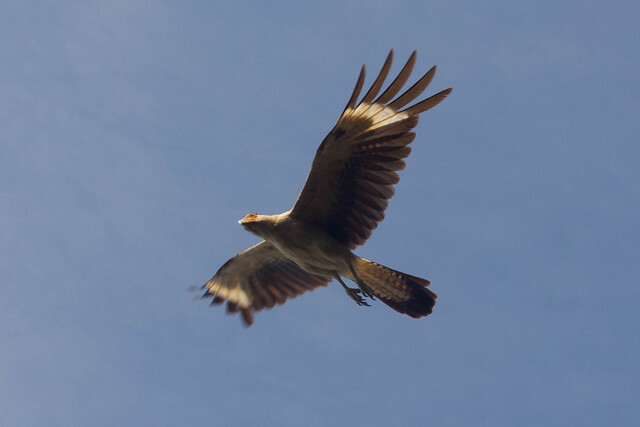 We continued criss-crossing the woods during the day and saw wild turkeys, chicken, and a bunch of other birds. 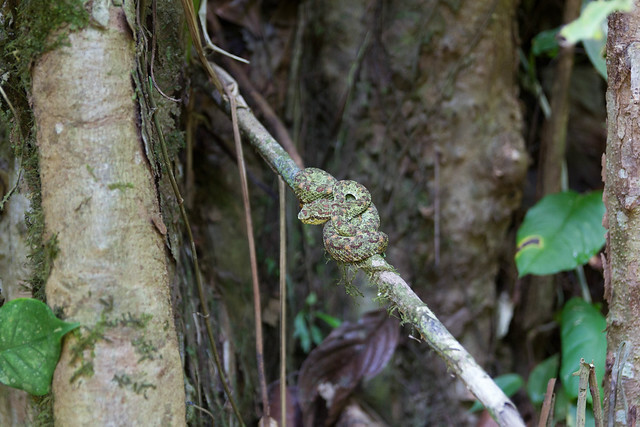 When I asked Randall for the presence of tarantulas, he told us to hold our ears to a hole in a tree, where we could hear a low humming noise. He said this noise came from a tarantula a bit up in the hole. 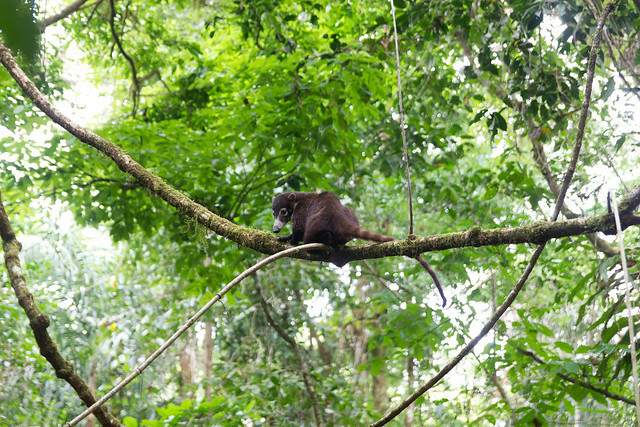 On the mammal side we saw a couple coatis (a central American relative of the racoon), and agutis (oversized guinea pigs on stilts). 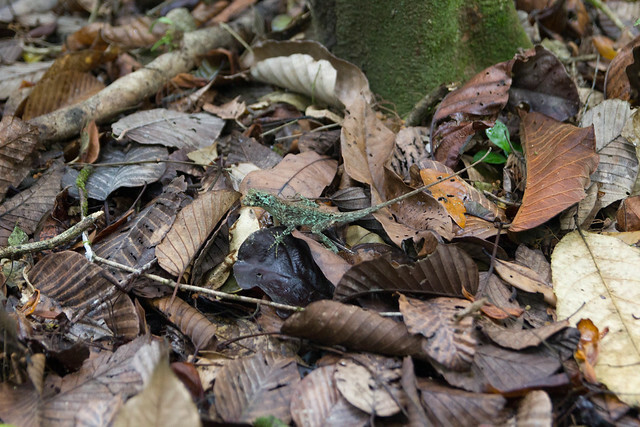 Highlights of the day hikes were a chameleon gecko landing in the dead leaves and changing its color from green to brown and an eyelash pitviper (just because it’s poisonous). Random coati, they are everywhere. 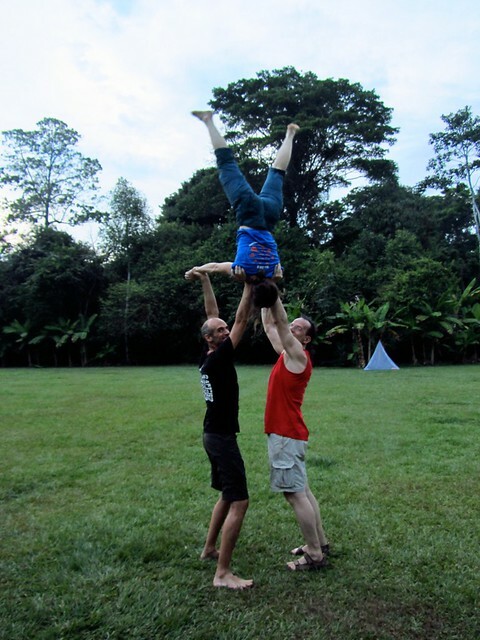 In the evening it was time for the La Sirena acrobatics mini-convention and a bit of workout in the airstrip with Dieter and Sinja from Frankfurt. A Costarican gal joined us for a bit. The other tourists preferred staying in the audience. On the next morning we left La Sirena at 5 AM to be able to cross a narrow part of the beach before high tide. The hurry did not keep us from looking for a puma that was in the woods right next to us. It however decided to leave without a photo-shoot. 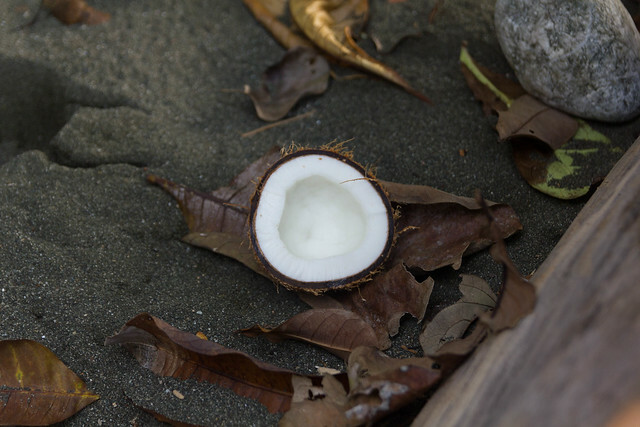 Once we had crossed the narrow part of the beach, it was time to have a fresh coconut (thanks Miguel for getting it). 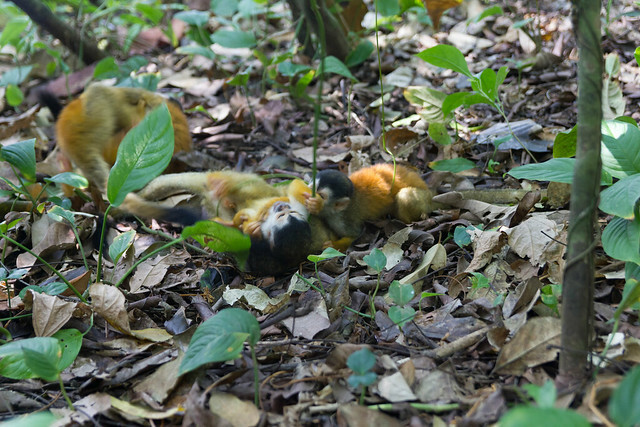 A bit later a group of squirrel monkeys went crazy around us and we got ample opportunity to take photos and videos (of course this was the moment when I had to swap memory cards). 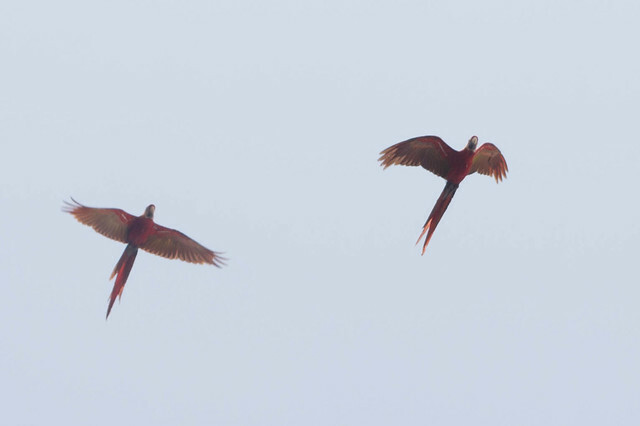 After a refreshing bath in a crocodile-free river, we headed out of the park – not without taking a gazillion photos of the scarlet macaws. Fresh as can be coconut. Monkeys going crazy, Click here for a video. Quick bath in the river. 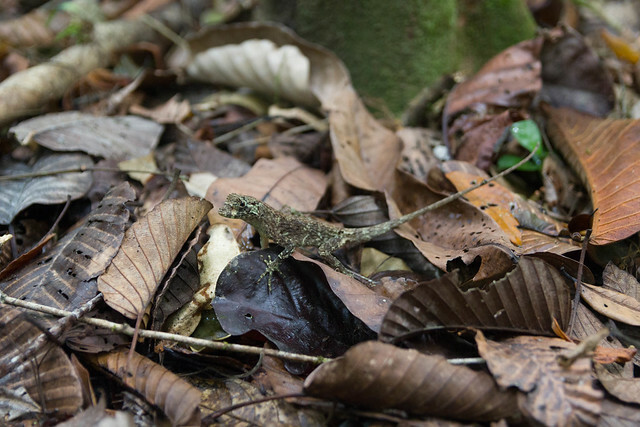 All in all it was a fun trip that complemented Parque National Manuel Antonio surprisingly well. If you want to visit it, it might be a good idea to call guides and agencies in advance, especially during high seasons like La Semana Santa (Easter). If you want to see more images, just click on one of them and move around in the photo stream on flickr.